Phytosterols: organic molecules found in many fruits and vegetables. Phytosterols' special structure allows them to inhibit the intestinal absorption of cholesterol, thus reducing the level of LDL cholesterol in the blood. Coenzyme Q10: also called ubiquinone, this substance is required for the proper functioning of all the cells in the human body, especially those cells that must consume high quantities of energy, such as heart cells. Policosanol: a complex alcohol molecule that reduces LDL and simultaneously raises levels of HDL ("good" cholesterol). Policosanol also lowers elevated levels of triglycerides, prevents the development of atherosclerosis, reduces blood pressure, improves blood circulation, prevents heart disease, and helps in effective rehabilitation after cardiac events and stroke. Directions for use: 2 caplets per day with a meal. 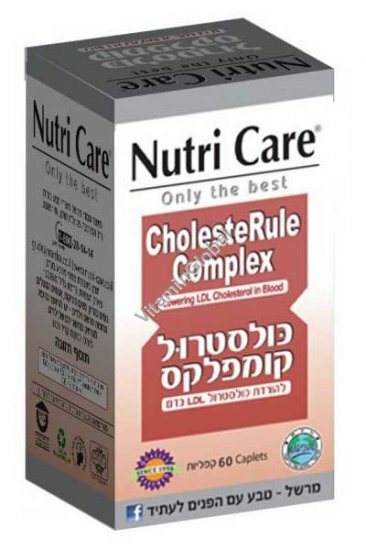 Kosher Parve, Badatz "Beit Yosef"
Pregnant women, lactating women, people taking drugs, and parents considering this product for their children should consult a doctor.